Located in Midtown, INNSIDE by Melià New York Nomad is within a 5-minute walk of popular attractions such as Madison Square Garden and Fashion Institute of Technology. This 313-room, 4.5-star hotel welcomes guests with a restaurant, a 24-hour fitness center, and free in-room WiFi. This hotel is home to a restaurant and a bar/lounge. Start each morning with buffet breakfast, available for a fee from 7 AM to 11 AM. 42-inch a flat-screen TV are available for entertainment, and guests can stay connected with free WiFi. Beds sport premium bedding and the bathroom offers a rainfall showerhead, a hair dryer, and designer toiletries. Other standard amenities include a refrigerator, a minibar, and an espresso maker. 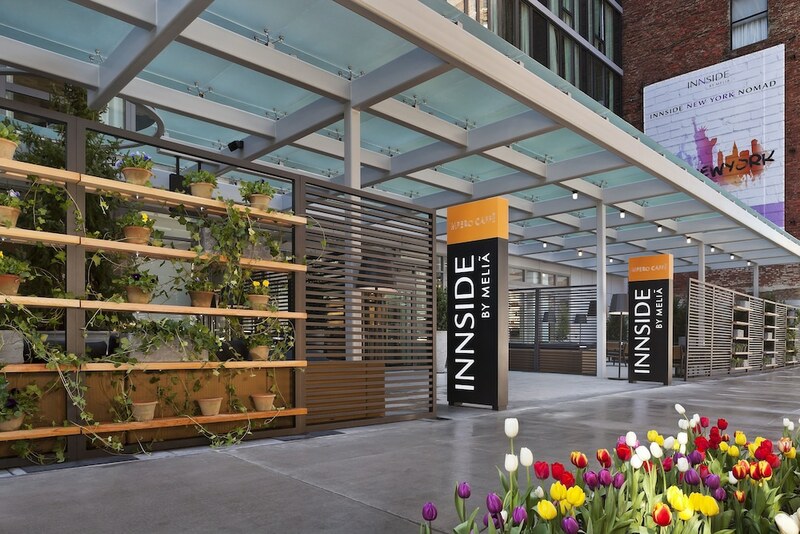 INNSIDE by Melià New York Nomad features a 24-hour fitness center, free WiFi in public areas, and conference space. Transportation is made easy with limo/town car service. Multilingual staff at the 24-hour front desk can assist with luggage storage, tours or tickets, and dry cleaning/laundry. Other amenities at this luxury hotel include a 24-hour business center, coffee/tea in a common area, and a computer station. A computer station is located on site and wireless Internet access is complimentary. Event facilities measuring 1170 square feet (109 square meters) include conference space. This luxury hotel also offers a 24-hour fitness center, a terrace, and tour/ticket assistance. INNSIDE by Melià New York Nomad is a smoke-free property. INNSIDE by Melià New York Nomad offers 313 air-conditioned accommodations with minibars and laptop-compatible safes. Beds feature premium bedding. Flat-screen televisions are featured in guestrooms. Refrigerators and espresso makers are provided. Bathrooms include bathtubs or showers with rainfall showerheads, designer toiletries, complimentary toiletries, and hair dryers. This New York hotel provides complimentary wireless Internet access. Business-friendly amenities include desks and phones. Additionally, rooms include complimentary bottled water and irons/ironing boards. Housekeeping is offered daily and hypo-allergenic bedding can be requested. Start your morning with a buffet breakfast, available each day from 7 AM to 11 AM for a surcharge. Children under 17 years old are not allowed in the fitness facility without adult supervision. Guests under 18 years old are not allowed in the fitness facility.